Acronis True Image Home is a powerful home PC backup program that offers various backup solutions in a user-friendly layout so your data will be safe at all times. - 5 GB of free online storage for one year. - Disk imaging lets you backup & restore the configuration of your computer, operating system included. You are also offered the possibility of saving a copy to the cloud. - Supports Windows operating systems from XP to Windows 8. 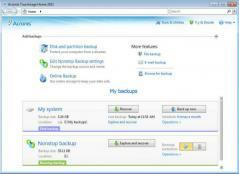 - Incremental backup is available for both local and online storage. Incremental backup is much faster than the full-system backup as it just captures the changes made since the last backup. - Automated file synchronization between multiple devices. - The program updates your backups even as you work with the original files, so your backups will always include the latest modifications.